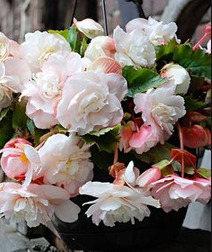 Angelique Super Novelty Begonia As one of the top three landscape and garden plants in production, it is not surprising that gardeners and breeders alike are always seeking new varieties of Begonia. Our super novelty Begonias are fragrant, yes that's right fragrant. Now you have the opportunity for colour and scent in your shady spot. Angelique will delight your senses with beautiful, 4 inch cascading tresses of pure white blooms with a pink blush. The best choice for a container in areas protected or sheltered from the hot afternoon sun. One 6 plus cm tuber in each package.